Blackout curtains for your bedroom are a must if optimising sleep is on your list of priorities, and like a sleeping environment that's as dark as possible. Combining curtains with blackout blinds can ensure that early sunrises don't get in the way of a restful night sleep, allowing you to sleep through until your body clock gently nudges you awake. But combining them with blackout curtains will give you double the protection from the sunrise. Great insulators, blackout curtains are also successful in helping to retain heat during the winter and keeping heat out in the summer, making it easier to set the optimum environment for sleeping. With light blocking, sound blocking and heat blocking properties, blackout curtains are definitely a great options for the bedroom. Check out our pick of the best, then see some great bedroom curtain design ideas to inspire the look of your scheme. What are the best blackout curtains? We think that for he ultimate perfect fit, noithing beats the Made To Measure Woven Blackout curtains from Very. Substantial and heavy, they are also easy to clean thanks to their durable polyester fabric. For kids' rooms, look no further than the Little Home Glow in the Dark Star Blackout Curtains by John Lewis and Partners. With their little glow in the dark stars, these blackout curtains are perfect for children’s bedrooms. Effective at blocking out early morning light and light pollution, its little stars will emit a subtle glow even in complete blackness – the perfect comforting presence for children scared of the dark. Part of John Lewis & Partners Little Home range, there are plenty of matching features for use throughout the rest of the scheme. 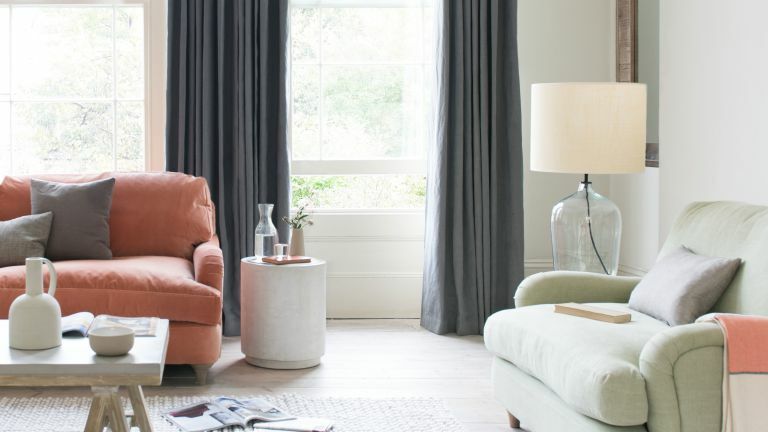 The smoky colour of these curtains provides a beautiful neutral shade that will complement a range of colour palettes. Made to measure, uniquely sized windows are completely catered for, while those who desire exacting specifications can have their expectations met. Whether you prefer a pleated or smooth finish, you’re completely in control when it comes to purchasing these blackout curtains. If you want your curtains to make a statement, the detailing on this pair from Wayfair will certainly draw the eye. Combining the luxurious textures and styles of both velvet and satin, these curtains are decadent without being overwhelmingly heavy. With velvet in the detailing, rather than the main body of the curtain, they're lighter than our first pick and will work well with other items from the Catherine Lansfield range. While metal eyelets are sturdy in their design, they do allow a little light to filter through, which may or may not be enough to disturb your sleep. Aside from that, these lightly patterned grey curtains are perfect for lifting neutral bedroom or living room spaces. Featuring a thermal blackout lining, they help to retain the heat in the winter months and block any unwanted draughts. If you're looking to add a luxurious feel to your space, consider experimenting with velvet textures. These gorgeous Crinkle Velvet Eyelet Curtains from Next not only ensure a better night sleep thanks to their blackout properties, but add a distinctly glamorous feel to a scheme – especially when chose in this gorgeous blush pink shade.